Teach Mentor Texts hosts It's Monday! What Are You Reading? 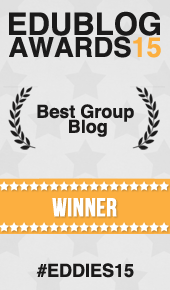 Click on the image to join the conversation. A few weeks ago, I saw some people participating in IT’S MONDAY, WHAT ARE YOU READING?, a meme hosted by Jen and Kellee at Teach Mentor Texts. I’m thinking maybe this is a solution. So in the same vein as The Book Stack, only maybe a little less intimidating for me to keep up with, I’ll informally share the books we’re reading around my house. The added bonus is connecting with a community of readers. BUNHEADS by Sophie Flack (Published by Poppy, an imprint of Little, Brown and Company; released October 2011; review copy provided)– This book is about a dancer in an ultra-prestigious ballet company. What gave me pause and made me want to read the book is the author danced with the New York City Ballet from 2000 -2009. I was not disappointed and will add this to my (very selective) shelf of go-to YA books. (This is my personalized collection of mentor texts I use as a YA writer.) I am impressed by the way Flack took something that seems so untouchable to me (a prestigious ballet company) and placed me smack in the middle of that world. I felt like I was part of the ballet culture, like I was sitting in the dressing room or standing backstage watching the dancers perform. Flack also masters tension in a way that makes me want to flip to page one and read this book again just to study the art of her craft. Lucky us…here’s a video of Sophie Flack talking about her experience writing BUNHEADS. 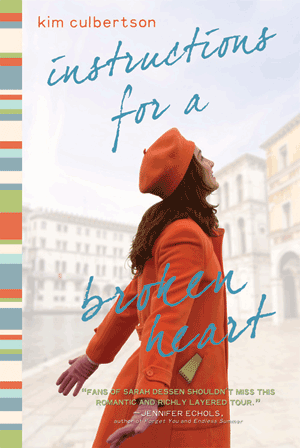 INSTRUCTIONS FOR A BROKEN HEART by Kim Culbertson (Published by Sourcebooks Fire, an imprint of Sourcebooks; 2011; review copy provided) — I wanted to read this book because it was set in Italy. One of the things I really liked about ANNA AND THE FRENCH KISS by Stephanie Perkins was the chance to be surrounded by a new place. INSTRUCTIONS FOR A BROKEN HEART makes me feel like I’ve visited Italy after reading the book. (Or maybe I should say it confirms for me that I should visit Italy as soon as possible!) Much like BUNHEADS, the author makes me feel like I’m part of something that seems so far away from my world. I like it when books do this to a reader. As I read, I noticed the way Culbertson developed the characters. We get to travel along with the main character, Jess, and watch as she learns to not only depend on herself, but trust again after her heart has been broken. At the end of the book, I feel like I’ve met each of the characters. This is what I want readers to feel like when they read my stories. Here’s a book trailer for INSTRUCTIONS FOR A BROKEN HEART. As always, I can’t wait to hear about the books in your book stack. Leave a comment and let me know what you’re reading…and join up with other readers at It’s Monday! What Are You Reading? via Jen and Kelly at Teach Mentor Texts. Thanks for sharing these books with us. I’m totally going to read them once I get my Kindle!! 🙂 Have a happy holidays! On my I-pad I am reading for myself – The Cabinet of Wonders by Marie Rutkoski and to my fourth graders at school – Lion Boy by Zizou Corder ( always love to start a series that they love and can continue to read when I have finished). The adult teacher read is Mechanically Inclined: Building Grammar, Usage and Style into Writer’s Workshop by Jeff Anderson. Loved hearing about what you are reading. Bunheads intrigues me and if Instructions is anything like Anna I want to read it now. Today, I’ll be reading from the holiday book tub at the bedtime of my little elf — most likely “Olivia Helps With Christmas” and “Once There Was a Christmas Tree” (which I secretly love because of the way Jerry Smath paints opportunities for his characters to share something near and dear to their hearts —- their own Christmas trees). For myself, I’m reading “The Book Thief” which I heard you mention last summer. It is captivating. Markus Zusak’s writing style makes me want to twirl and spin. Beautiful! Well, today I’m reading picture books to my little granddaughter: I love My Mama and The Grouchy Ladybug are two of the stack. I’m also reading Chime by Franny Billingsley and about to finish The Food of A Younger Land, about the writers of the WPA. Great non-fiction articles about food traditions in the Depression. Love your idea of the Book Stack-they are certainly everywhere! And thanks for the heads up to the two novels, which sound so good. Um-m, guess they’ll go on my wish list! I enjoyed hearing about your reads. Our reading group is reading The True Memoirs of Little K by Adrienne Sharp which is about a prima ballerina of the Russian Imperial Ballet in St. Petersburg in the 1800’s. 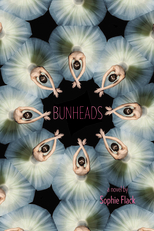 It is a story of “love, loss, and history.” I love the cover on The Bunheads, and I would never had called a ballerina a bunhead!!! Love the idea of sharing book reads!